Jim Cox came to the Hurricanes as one of the most sought after athletes in South Florida. The Baltimore native moved to Miami with his parents at a young age and attended Christopher Columbus High School. Jim was the quarterback on the football team, led the baseball team in batting average, and helped the 880 relay team shatter the school record. But once he landed in Coral Gables, the Miami coaches switched him to wide receiver, and he would make his mark on the Hurricanes record books. He even beat out Ted Hendricks for the position, who switched to the defensive side of the ball and made his own history. 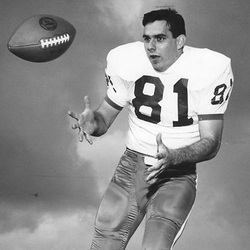 Even though the offense used mostly a running scheme, Jim left school with career records for touchdown passes caught ( 12 ), receiving yards (1,464 yards) and was second in passes caught (97). As a junior in 1966, he caught 41 passes for 627 yards, including 9 receptions for 128 yards in a 21-16 victory over soon-to-be Heisman winner Steve Spurrier in Gainesville to secure a berth in the Liberty Bowl. The Canes ended the season with an 8-2-1 record following their 14-7 victory over Virginia Tech in the bowl game. It was Cox who set the stage for Miami's winning touchdown with 3 receptions for 61 yards in the 70-yard goalward drive. He was named the Liberty Bowl's "Most Valuable Player" and the game's "Oustanding Offensive Lineman". That year, he was also named first team All-State. This is how he was described in his senior season's media guide..."Big in size, lightning fast, deceptive moves, sensational catching ability, maneuverability, desire and competitive spirit are the ingredients that make Cox a great football player-a player with every possible All-America qualifications." In 1967, Cox caught another 39 passes for 552 yards as the Hurricanes finished 7-4, including their 3rd straight win over Florida, and a berth in the Bluebonnet Bowl. He was named to the Chicago Tribune All-American Team that played a game against the NFL Champion Green Bay Packers. For his career, Jim had 5 games with 100+ yards receiving, and he caught an 80-yard pass from Bill Miller against L.S.U. in 1965, which was then the 2nd longest pass play in school history. His 12 career touchdown receptions still ranks #6 all-time, tied with fellow inductee Bubba Franks. He was drafted in the 2nd round (54th overall) of the 1968 NFL draft by the Miami Dolphins and played in 13 games that year, catching 11 passes for 147 yards. He is now retired and lives with his wife, Grace, in Ronald, Washington.